An absolute cracker of a book. This is definitely my favourite of Liz Nugent's books. 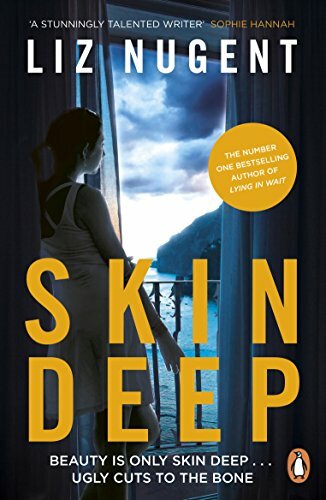 After reading Lying in Wait I was a little worried that her books were too dark for me but I was blown away by how much I enjoyed Skin Deep. Cordelia/Delia is a unique, crazy and sometimes evil character but I liked her nonetheless.....I don't know if that makes me crazy too or maybe Liz Nugent is just a literary genius who can inspire sympathy and empathy for a truly awful, train wreck of a person/character. At times I felt like giving Cordelia a good kick whilst simultaneously hoping and wishing my hardest that she wouldn't ruin the next bit of good luck to come her way. There is a great range of side characters, some of whom were as equally crazy as Cordelia but maybe just not quite as destructive. I did feel sorry for Harry but by the end of the book I was more disappointed in how weak he proved to be. I was equally surprised at Peter and how emotionally strong and loving he was. I liked him a lot. This was a brilliant, brilliant book. One I'll be raving about to all and sundry for a long to come. Skin Deep is out now in all good book shops. You can also buy online at Kennys.ie with FREE world wide delivery.